Raise your brand awareness with personalized wings for your flight crew. 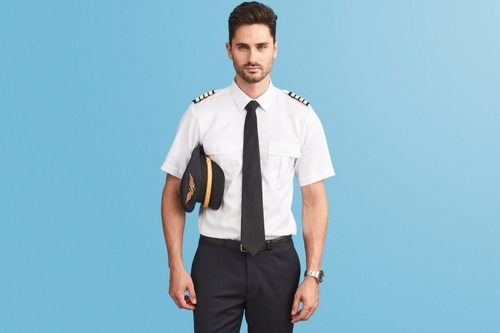 Options are plenty and wings will add a perfect final touch to your pilot uniform. To wing it may refer to an English idiom meaning to improvise. Quite the opposite is true for pilot wings; they need your full attention. “There was nothing more exciting for a child passenger than to be presented with a pair of souvenir pilot's wings”. They are special. They represent decades of tradition and add to the mystical character of airline pilots. Getting it right, however, is more complex than it may sound. Pitfalls need to be avoided, and to learn how. Keep reading. On the cap? On the jacket? Or both? KLM, American Airlines and others are moving away from the use of pilot caps (sad development as the pilot cap represents decades of tradition and values), meaning commercial pilot wings only feature on uniform jackets at these carriers. In contrast, Icelandair stay true to tradition and feature flight pins on caps and jackets, highlighting a classic, professional look. Pins vary in size, however, with the cap featuring a slightly larger wing than the jacket. A chest pin will be too small to feature on the cap, and vice versa. Similar to embroideries, the detail level will have the creative mind working overtime. Less is more might be taking it too far, but the most successful pilot pins boast a clean, sharp design with a few carefully chosen details to make it stand out. Too many details will make brand message hard to decode – or result in an unproportionally large wing. We recommend incorporating your company logo or company name, and maybe one or two insignia if fitting. However, on occasion the company name can be too long to feature on custom wings. Abbreviated names or a logo is the way to go if you face that conundrum. You should also carefully consider your color combinations. Pilot wings should convey professionalism and boast of authority; they should not look cheap. We recommend our clients opt for metal pins with a gold or silver finish. A perfect result requires more than a great design. You also need to take a close look at the shape of the wing and match it to the cap. The pin should follow the contours of the cap and bend slightly inward. Custom pilot wings allow you to focus on the details. Don´t miss the opportunity to create the perfect look by discarding the small details. They matter – so too the weight. If the wing is too heavy, it might point slightly toward the ground. The same may happen if the locking mechanism is of poor quality. Remember to test and test again to ensure your custom pilot wing fits perfectly and highlights a professional pilot appearance. Flight pins are not limited to pilots. Pins will also add a unique look to cabin crew uniforms, whether they feature on flight attendant hats or on the jacket or dress. Jazeera Airways complement their crew look by adding a custom pin. They have gone for a different color to their pilot pins, as well as opted for a half wing, to differentiate the functions. Several other carriers have also added half wings to uniform jackets and dresses, while Qatar Airways and others use custom pins as a signature feature. Flight pins offer a great addition to any brand look and will make your flight and cabin crews stand out as they are easily recognizable to passengers. Reach out if you want to boost your airline uniforms with custom solutions.